One of the first posts I wrote when I started blogging last year was about Persephone Books. Along with Virago, Persephone has been the greatest discovery I've made as a reader. 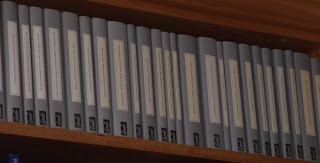 I'd read Nicola Beauman's book, A Very Great Profession (originally published by Virago but now Persephone No 78) & it inspired me to search out some of the books she wrote about. 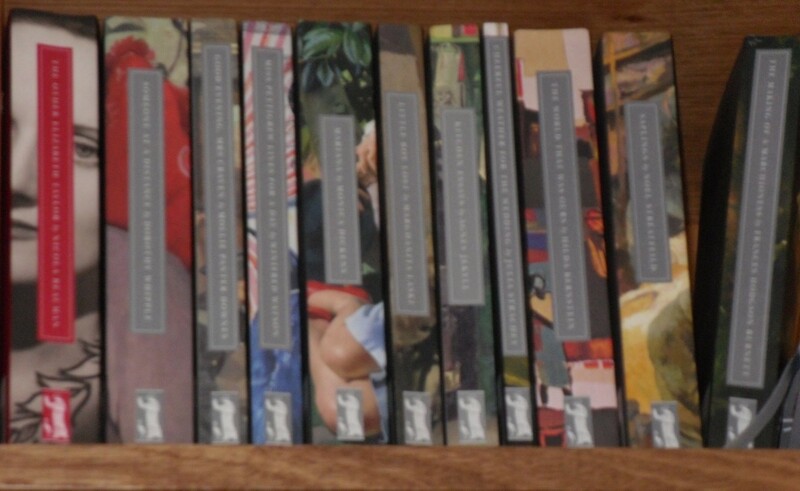 Many of them were published by Virago but there were other authors I'd never heard of & their books were impossible to find in libraries or secondhand here in Australia. 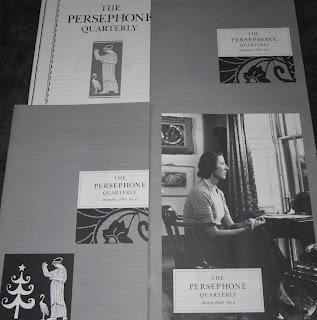 Then, in late 1999, I was looking for the Virago website one day & came across the Persephone Books website. I was immediately interested in the titles & subjects. I'd always been interested in WWI & WWII fiction & non fiction so Mollie Panter-Downes's short stories, Good Evening, Mrs Craven, Cicely Hamilton's William - an Englishman & Nicholas Mosley's Julian Grenfell became my first Persephone order. I took advantage of the cheaper price for 3 books & two months after my first three books arrived & were devoured, I ordered three more & then three more. 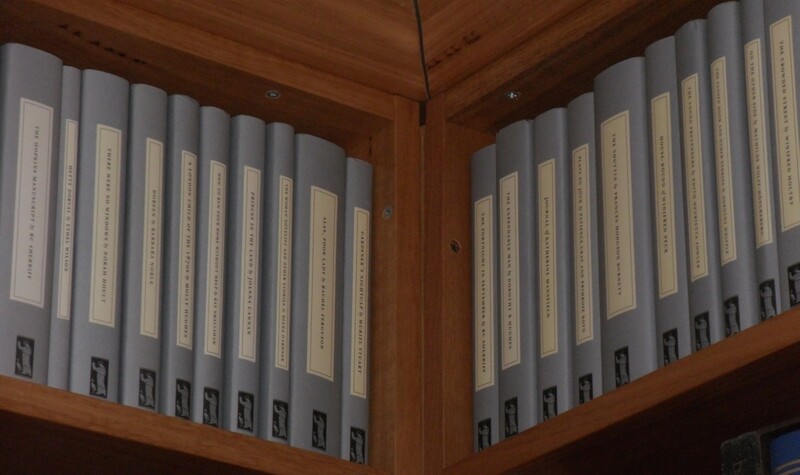 Then, I set up a standing order & the result is a complete set of Persephones as you can see! 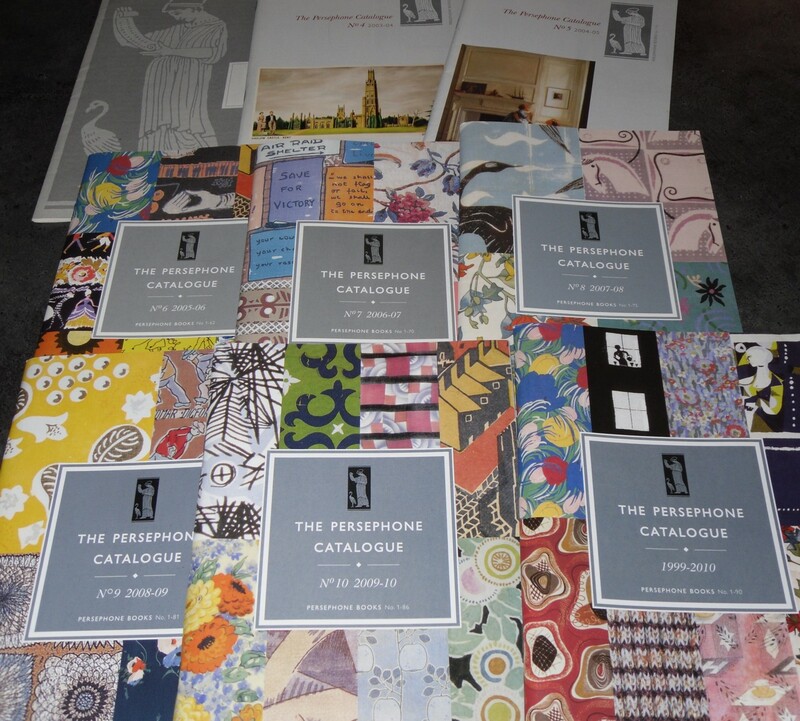 Then, the Persephone Classics were launched & I had to have those as well. I told myself they could be lending copies as I rarely lend Persephones to anyone but I was kidding myself really. They are such beautiful books & I wanted them. 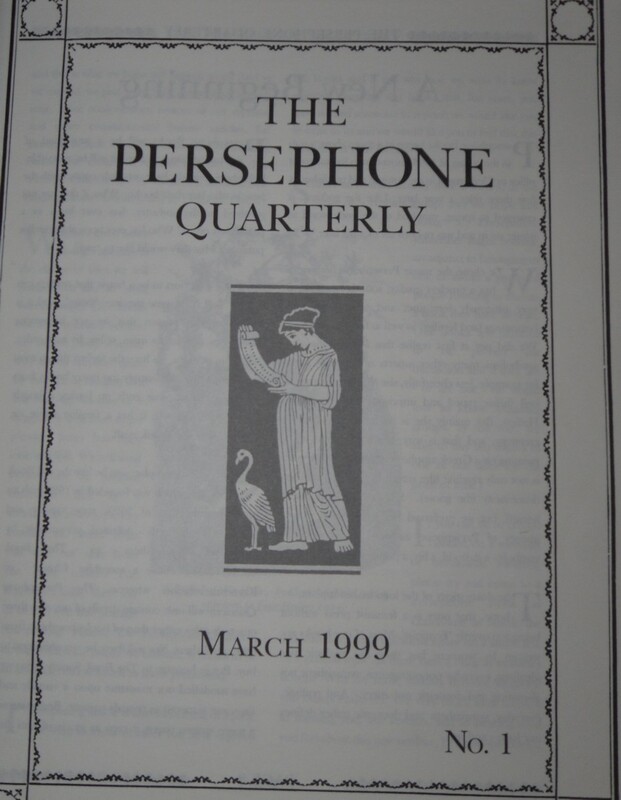 I also have a complete set of Persephone Quarterlys (now the Biannual) & I often go back & look through the early editions that set out the Persephone philosophy & admire the woodcuts that were such a ffeature of those early PQs. 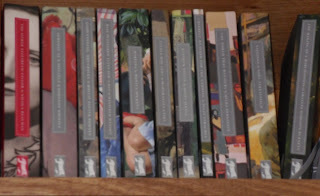 These are some of my favourite covers, from the earliest elegant grey covers to the colour editions with pictures that have been used on Persephone Classics or Virago Modern Classics. Thank you to Verity & Claire for hosting Persephone Reading Weekend. It's been a chance to look back over the years I've spent reading Persephones, flicking back through old PQs & Catalogues, admiring the gorgeous endpapers & elegant design of a collection of books that I love. Cristina from Rochester Reader was asking after Abby last week so I thought it was probably time for an Abby update. Abby's very well. 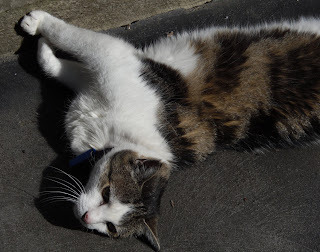 She had a visit to the vet a week ago as the result of some bleeding from her bowel & we discovered from a blood test that she has hyperthyroidism which is very common in older cats (she's 16). She was on a bland diet for a few days & she's had a course of antibiotics. After the first day, she was completely fine and it's impossible to tell if the bleeding was just one of those things or something more serious. I think she just picked up something in the garden that irritated her on the way through. She's on tablets for the thyroid condition & we go back for another blood test in a fortnight to see if the medication has lowered her levels. The bland diet wasn't a great success but she put up with it pretty stoically whuile it lasted. We're both enjoying the end of summer here in Melbourne. The last week has felt distinctly autumnal. A few nicely crisp mornings & not too hot during the day. Fingers crossed that summer really is over & I can start planning winter mornings cooking soups, stews & chocolately treats & long afternoons reading & listening to music. I took these photos yesterday. 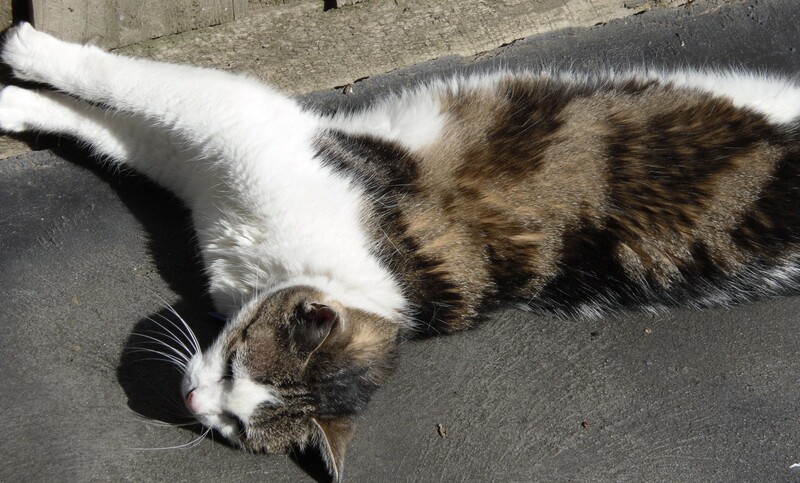 Abby's morning routine usually includes sunning herself against the back fence, sharpening up her claws on the timber. 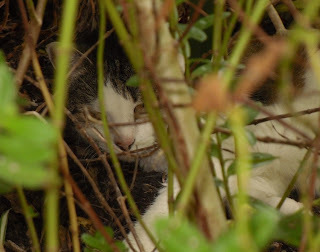 Then, after lunch, she likes to have a snooze in the shrubbery in the front garden. She doesn't look very pleased with me, I may have woken her up. I'm sure she'll forgive me around dinner time, she always does. Five unread Persephones. 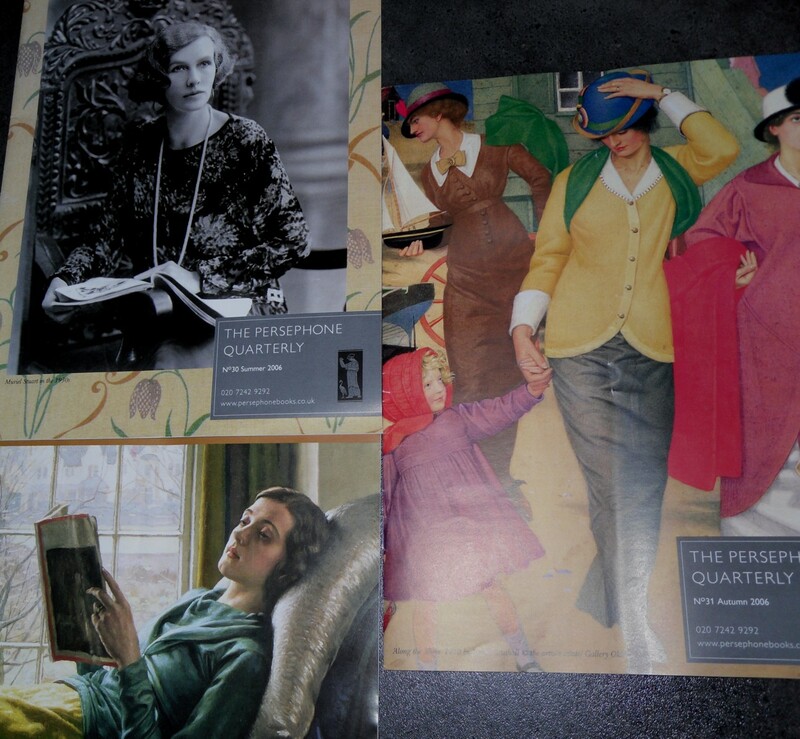 Which one to choose for Persephone Reading Weekend? 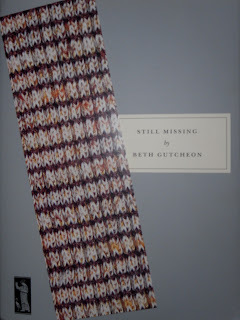 Then, a friend from my online reading group said that she had read Still Missing by Beth Gutcheon in just two days & loved it. That was it, decision made! I often seem to use the word unputdownable when I review Persephones. Usually it’s the Dorothy Whipples. I love her characters so much that I stay up late with my eyes propped open to find out what’s going to happen to them. The Hopkins Manuscript by R C Sherriff was another compulsive reading experience. I read it on a thundery, stormy Sunday afternoon & the weather suited the book with its feeling of apocalyptic doom. 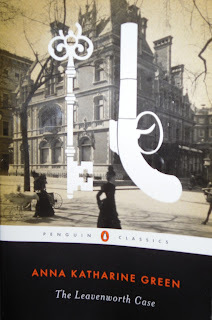 Little Boy Lost by Marghanita Laski, one of my very favourite Persephones, was another book I read once in a great rush to find out what would happen & then again, more slowly, to savour the writing & feel the real emotional jolt from the characters & their situation. Still Missing is the most involving book I’ve read for ages. I read 150pp in one sitting & I barely drew breath. My stomach was clenched the whole time. If I hadn’t had to get up for work next morning, I think I’d have sat up half the night. I read the rest of the book the next night, nothing would have stopped me getting back to this book. Susan Selky waves goodbye to her six year old son, Alex, one morning. He’s been walking the two blocks to school on his own for a while now & he turns to wave to his mother before he walks around the corner. Alex doesn’t make it to school. Susan doesn’t realise until he doesn’t come home. She rings a friend & discovers from her daughter that Alex wasn’t in school. Uh-huh, thought Menetti. Now it starts. It can’t happen to me. It happened to her, she lost her kid, but if there’s something funny about her, then there’s a reason it could happen to her but it couldn’t happen to me. Now starts the drawing away, the pulling aside, the setting the Selkys apart. Susan wondered if she saw in Jocelyn’s eyes a flicker of impatience. She wanted to help me, thought Susan, and if I’d taken her pills, she’d have felt better. How quickly a person in pain whom you can’t help becomes a reproach. And then, no doubt, a thorn. As the investigation continues, the police move in to Susan’s house, monitoring her phone calls, chasing up any lead, keeping the press at a distance. As the case loses momentum, Susan pursues any clue, however minor. She agrees to appear on television, give interviews, anything to keep Alex present in the mind of the public. Her every move & utterance is judged by complete strangers who feel they have the right to comment on her looks, her demeanour, her parenting skills. Some of them come right out & accuse her in the supermarket or on the street of murdering Alex or of killing him by neglect. Then there are the letters & phone calls from nutters, dreamers & the psychics who seem to offer hope that Alex is alive although they can’t see where he is. In the middle of the third week, the police took out their bank of phones, folded their table, and left the house. The taxpayer is entitled to the expense of that kind of search effort for only so long, and Susan had had her allotment. In the sudden quiet that fell on the house as they departed, Susan felt that she was experiencing Alex’s death. After the first death, there is no other. But Graham and Susan had lost their child so many times. 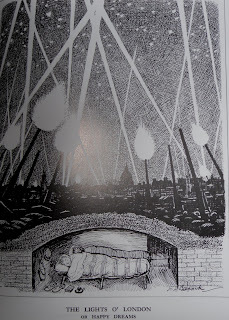 Graham’s mourning was ferocious, like a man who walks deliberately into the heart of a storm and opens his coat to it and uncovers his head. Susan’s grieving instead seemed to be held inside her, as slow-burning hardwood holds the heat, or a well-tempered carbon knife holds an edge. She had lost her son; she had lost her own youth. Within her, as if in every cell, was something that would never cease to ache. That anguish was all that remained of her son’s life. Her grief, closed within her, was all the grave her son would ever have. Still Missing was first published in 1981 so in period, it’s not a typical Persephone. The Persephone qualities that this book shares with the more typical Persephone written in the 1920-1950s are the readability of the story & the emphasis on the importance domesticity & the home. 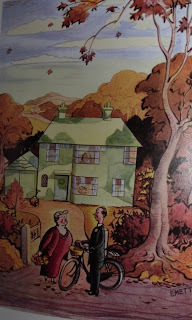 Susan’s house is at the centre of the book. It’s her refuge & her prison. It becomes a beacon, a point of familiarity to guide Alex home if he is still alive. It’s the repository of all her memories of Alex. It’s where the story begins & ends. Still Missing is not an easy read but it is a compulsive one. This is one of the most memorable books in the Persephone list. 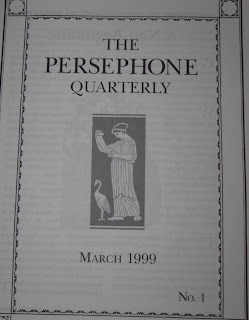 Persephone Reading Weekend is kindly hosted by Verity & Claire so follow the links to their blogs to catch up on more wonderful reviews by lovers of Persephone. Tomorrow, I’ll share photos of my Persephone collection & post about my first Persephones & how I discovered them. The events of the last few years of the life of Catherine of Aragon are well-known. Married to Henry VIII for over 20 years, she refused to allow her marriage to be annulled so that Henry could marry Anne Boleyn & produce a male heir to the throne. Catherine had been first married, at the age of 15, to Henry’s older brother, Arthur, Prince of Wales. Arthur died only months after the wedding & there has been speculation ever since as to whether the marriage was consummated. Betrothed & eventually married to the new heir, Henry, Catherine’s many pregnancies resulted in only one surviving child, her daughter, Mary. Catherine always denied that her marriage to Arthur was consummated & her defiance of the King & stubborn determination that their marriage was legitimate, was one of the causes of the major changes to the English Church during Henry’s reign. Catherine’s refusal to deny her marriage vows led to her gradual isolation from the Court & her daughter & she ended her life at Kimbolton House in Huntingdonshire, dying in early 1536. Catherine’s early life is a story less often told. 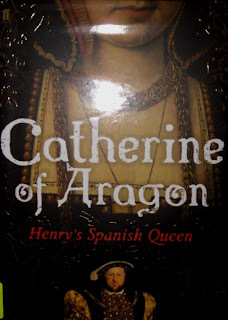 Giles Tremlett’s new biography takes full advantage of his familiarity with the Spanish sources for Catherine’s life. Catherine was the daughter of the monarchs who united Spain in the late 15th century. Isabella of Castile was one of the first women to rule in her own right & her marriage to Ferdinand of Aragon united the two most powerful Spanish kingdoms. 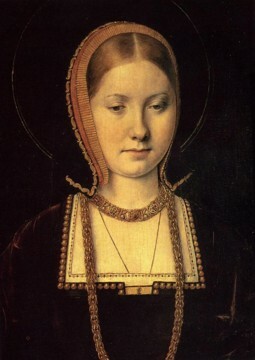 Catherine’s childhood was spent travelling around Spain with her parents’ Court. She was betrothed to Prince Arthur, heir to Henry VII at a very young age & the marriage was to take place soon after Arthur’s 14th birthday. The match was very important for Henry. His Tudor dynasty was very new & desperately needed an alliance with a great European monarchy to lend legitimacy to its rule. Catherine’s parents were concerned about the number of pretenders & rebellions plaguing Henry’s reign & Henry’s response is detailed in Desmond Seward’s book, The Last White Rose. Catherine arrived in England in 1501 & the wedding celebrations were lavish. The young couple, as Prince & Princess of Wales, spent the few months of their married life at Ludlow Castle, the administrative centre of Wales. They both fell ill of the sweating sickness & Arthur died. Over the next seven years, Catherine was reduced to a political pawn as her father & father-in-law, haggled over her dowry, her maintenance & her future. Catherine was only 16, in a strange country where she barely spoke the language & knew very few people. She was often ill & Henry VII’s well-deserved reputation for avarice meant that her allowance was rarely paid. She was reduced to selling her plate & jewels to feed herself & her attendants. After Arthur’s death, Henry VII moved swiftly to betroth her to his 10 year old son Henry, now the heir to the throne. Catherine was well-treated while she was acknowledged as Henry’s intended bride but when her wily father dithered over paying the rest of her dowry, Henry VII started looking for ways to get out of the agreement. Catherine was isolated & in limbo for much of this period, although she did emerge into the limelight as her father’s ambassador at one stage, a unique role for a woman at the time. The long years of poverty & unhappiness came to an end when Henry VII died. This portrait of a young Catherine is from terminartors.com. Henry VIII was young & headstrong & he saw himself as a knight in shining armour rescuing the princess languishing in obscurity. He married Catherine & they were very happy together. She was overjoyed to finally be Queen of England, a role that had been her destiny from childhood. She threw herself into Henry’s enthusiasms for parties, tournaments & pageants. Although she was six years older than Henry, this seemed irrelevant when he was 18 & she was 24. It became more of an issue later as their children died young & it seemed increasingly unlikely that they would have a son. Henry was overjoyed when Mary was born but England had never had a Queen Regnant & Henry became obsessed with having a legitimate son to succeed him. 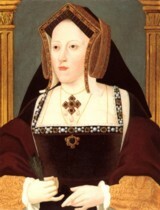 Before this happened however, Catherine played a vital role in Henry’s government. She was Regent while Henry was overseas fighting the French in 1514 & oversaw the campaign against the Scots that resulted in the English victory at Flodden, where the Scots King, James IV, was killed. Catherine was involved in Henry’s European diplomacy. As the daughter & sister of Spanish monarchs, she was a great help to Henry. Her influence only lessened with the rise of Cardinal Wolsey. There was never thing more pleasant nor more acceptable to me in my life... for I assure you all, that besides her noble parentage... she is a woman of most gentleness, of most humility and buxomness... If I were to marry again, if the marriage be good, I would surely choose her above all other women. The hearing that followed was extraordinary as the first time a King & Queen of England had been summoned by an ecclesiastical court. Cardinal Campeggio had come from Rome to preside. Henry was expecting a quick decision in favour of the annulment. Witnesses testified that Arthur had boasted of consummating his marriage & the young couple’s attendants were dragged out of retirement to recall memories of the short marriage. Catherine’s Spanish attendants were not called but they did give evidence & Tremlett has discovered their depositions in a Spanish archive. Naturally the Spaniards denied the marriage was consummated but their evidence should be accorded as much weight as the English witnesses. I have been to you a true, humble and obedient wife, ever conformable to your will and pleasure, that never said or did anything to the contrary thereof, being always well pleased and contented with all things wherein you had any delight or dalliance, whether it were in little or much... The twenty years or more I have been your true wife and by me ye have had divers children, although it hath pleased God to call them out of this world, which hath been no default in me... If there be any just cause by the law that ye can allege against me, either of dishonesty or any other impediment to banish and put me from you, I am well content to depart to my great shame and dishonour. And if there be none, then here, I most lowly beseech you, let me remain in my former estate. Catherine then dramatically left the Court, never to return. The proceedings dragged on, Catherine stubborn, Henry frustrated, Anne Boleyn growing more desperate. Eventually, Henry broke away from Rome, appointed Thomas Cranmer as Archbishop of Canterbury, & his divorce was granted by his new Church of England. To the end of her life, Catherine refused to bend an inch. 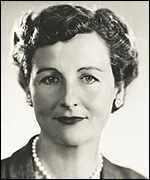 She refused to answer to the title of Dowager Princess of Wales & encouraged Princess Mary to defy her father. She saw her supporters, including John Fisher, Bishop of Rochester & Sir Thomas More, executed for refusing to accept Henry’s marriage to Anne Boleyn. Henry was afraid that Catherine’s nephew, the Emperor Charles, would declare war in support of her cause, but this became less likely as time passed. Henry & Anne were overjoyed & relieved when Catherine died in January 1536 although Anne didn’t enjoy her triumph for long. Catherine’s story is beautifully told by Giles Tremlett. His emphasis on her life in Spain as a child & his researches in Spanish sources give a fascinating picture of Catherine & her background. If you’re interested in the Tudor period, I’d recommend this book. 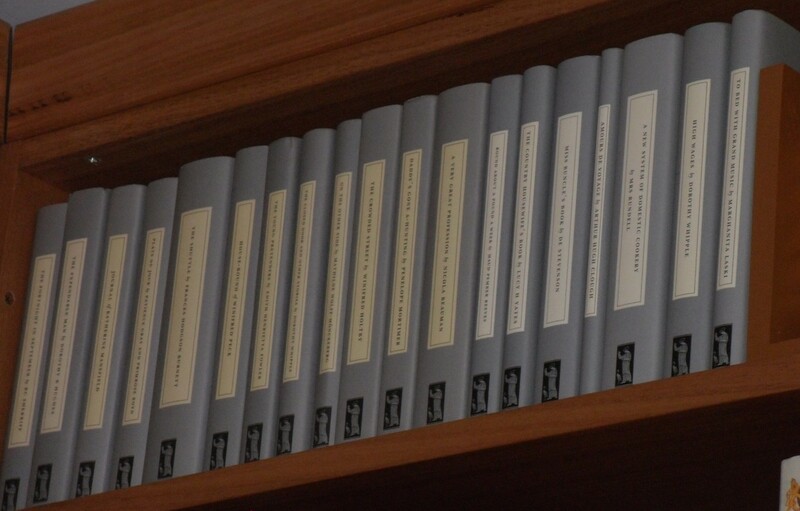 By the end of 2011, all of Nancy Mitford's books (except The Water Beetle) will be back in print. Penguin recently reprinted most of her novels, including the rare Wigs on the Green. In July, Vintage Classics are reprinting Nancy's four historical biographies, Frederick the Great, the Sun King, Madame de Pompadour (which I reviewed here) & Voltaire in Love. Vintage produce such lovely paperbacks with gorgeous cover designs so I can't wait to see what these look like. I will probably need to own at least a couple of them as well. In October, Capuchin Classics will be reprinting Pigeon Pie & Christmas Pudding, which I think will bring all of Mitford's novels back into print, probably for the first time. Capuchin republished Highland Fling just last year & it's now sitting on my tbr pile. Both the new Capuchin titles will feature their new colour cover pictures, just click on the links from their homepage to have a look. 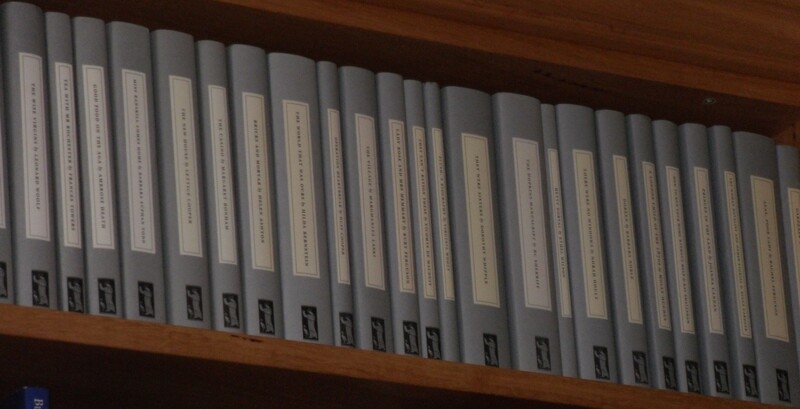 I read lots of Mitfordiana last year & I can't wait to get my hands on these titles to complete my collection. We are definitely living in a great time for the classic reprint. 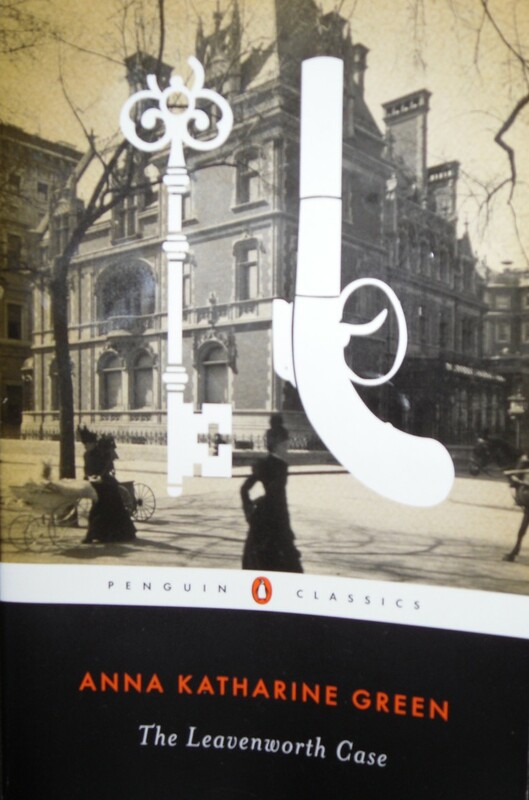 With publishers like Vintage, Capuchin, Greyladies, Persephone, Virago, Bloomsbury & Hesperus as well as Penguin & OUP with their 18th & 19th century lists, I could quite happily never read a modern novel again. 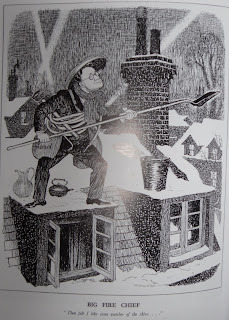 Well, maybe that's a bit too drastic, but there are very few modern novelists whose books I enjoy as I do those of Dorothy Whipple, O Douglas, Barbara Pym, P G Wodehouse, Marghanita Laski, Dorothy L Sayers let alone Jane Austen, the Brontes, Dickens, Wilkie Collins, Elizabeth Gaskell. I can't wait to see what the future holds. Maybe a reprint of Ann Bridge's Illyrian Spring which has been enthusiastically reviewed on many of the blogs I read, most recently by Verity here? Bloomsbury reprinted The Brontes Went to Woolworths which was the Holy Grail of middlebrow readers, now we're all desperate to read Illyrian Spring! Or more E H Young, after Harriet Devine's enticing reviews of William (which I also enjoyed) or Miss Mole? The sky's the limit, or should I say the dusty library stacks are the limit, as Dani at A Work in Progress has discovered. Anna Katharine Green was one of the first women to write detective stories & this book with a series detective was published nearly ten years before Sir Arthur Conan Doyle began publishing his Sherlock Holmes stories. Set in New York, The Leavenworth Case is the story of the murder of wealthy Horatio Leavenworth. He's found shot in the head one morning in the library of his mansion on Fifth Avenue. The room was locked & the key is missing but the weapon seems to have been his own pistol, found back in its usual place in his room. The house also seems secure so the obvious inference is that one of the family or servants is responsible. Leavenworth was unmarried but he lived with two nieces, Mary & Eleonore (they're cousins, not sisters) & it soon becomes obvious that one if not both of them had a motive to kill him. Horatio was a peculiar man. Incredibly wealthy, he had given a home to his nieces after they were orphaned. He seemed to love them both yet, on the grounds that one of the was more attractive than the other, he left all his money to Mary & Eleonore could expect very little. The girls seem to be on friendly yet not intimate terms. Brought up as sisters yet not treated equally. Leavenworth also had an unreasonable prejudice against Englishmen which will be an important clue to the actions of Mary & Eleonore in the months before their uncle’s death. At the inquest (held, as was customary at the time, at the scene of the crime), damning circumstantial evidence seems to point to Eleonore’s guilt. Her handkerchief is found stained with the grease where someone had cleaned the murder weapon. Eleonore was seen to take a piece of paper from the desk where her uncle lay dead & she admits to having handled the pistol on the day of the murder. One of the maidservants, Hannah Chester, disappears on the night of the murder & then there’s the mysterious stranger who was admitted to the house to see Eleonore on the night of the murder. Who was he & why did he visit the house twice, giving a different name on each occasion? There are red herrings, clues aplenty & another murder before this case is solved. The Leavenworth Case is narrated by a young lawyer, Mr Everett Raymond, who is an assistant to the Leavenworth family's lawyer (conveniently out of town). He is summoned to the house by Mr Leavenworth’s secretary, Trueman Harwell, on the morning the body is discovered to give some support & legal advice to the young ladies. He becomes involved in the investigation along with Ebenezer Gryce, the police detective in charge of the case. Raymond soon has another motive in discovering the identity of the murderer as he falls in love with Eleonore & is desperate to clear her from suspicion. 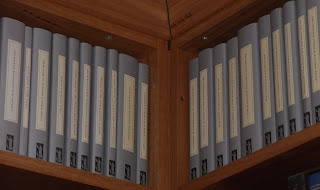 Now it is a principle which every detective recognizes the truth of, that if of a hundred leading circumstances connected with a crime, ninety-nine of these are acts pointing to the suspected party with unerring certainty but the hundredth equally important act one which that person could not have performed, the whole fabric of suspicion is destroyed. “You have said that if I declared my innocence you would believe me,” exclaimed she, lifting her head as I entered. “See here,” and laying her cheek against the pallid brow of her dead benefactor, she kissed the clay-cold lips softly, wildly, agonizedly, then leaping to her feet, cried in a subdued but thrilling tone:”Could I do that if I were guilty? Would not the breath freeze on my lips, the blood congeal in my veins, the life feint away at my heart? Son of a father loved and reverenced, can you believe me to be a woman stained with crime when I can do this?” And kneeling again she cast her arms over and about that inanimate form, looking in my face at the same time with an expression no mortal touch could paint, not tongue describe. Anna Katharine Green was a pioneer of detective fiction. This was her first novel & she went on to write more books featuring Ebenezer Gryce, as well as other series with her spinster detective Amelia Butterworth & Violet Strange. I’m looking forward to reading more of her work. After reading Peter Ackroyd’s The English Ghost last week, I was still in the mood for ghost stories. Susan Hill is the inheritor of the great tradition of ghost stories of the Victorian & Edwardian period. One of her novels, The Woman in Black, is probably the one of the most successful ghost stories ever written. It has been made into a TV movie & has been adapted for the stage. It has one of the most frightening ghosts I’ve ever encountered. One of the scenes in the movie was so scary, I remember jumping with fright. The same scene in the book was just as creepy. Susan Hill’s latest ghost story, The Small Hand, differs from the others she’s written because it’s set in the present rather than the past. Adam Snow is a rare book dealer. Driving back to London after a visit to one of his clients, Sir Edgar Merriman, Adam becomes lost & finds himself in the gardens of a dilapidated, abandoned house. As he walks through the gardens, he feels someone take his hand. It’s the hand of a child, trusting & confiding, but there’s no one there. Adam isn’t frightened, just curious. He finds his way back to the main road, goes home & gets on with his life. On his next visit to the Merrimans, he asks Lady Alice about the White House. She knows it as Denny’s House & shows him a magazine article about Denisa Parsons, the woman who restored the house & gardens. The gardens particularly were much admired & became a tourist attraction. Sadly, Denisa’s grandson drowned in a pool in the grounds &, after that, the gardens were abandoned, gradually reclaimed by the wilderness again. Adam is visiting a librarian friend in Oxford when he has his next encounter with the small hand. This episode is not so benign. Far from confiding & trusting, this time the hand is insistent, pulling him towards a pond in the Botanic Gardens. It takes all his strength to resist the temptation to let go & be dragged into the water. Adam’s brother, Hugo, had suffered a mental breakdown some years before. His symptoms had included a feeling of overwhelming desire to throw himself in front of a train or off a building. Adam is afraid that he is also heading for a breakdown & tries to talk to Hugo about his feelings, but Hugo downplays his fears. Adam travels to a remote monastery in France to look at a Shakespeare First Folio that he may be able to sell to Sir Edgar Merriman. On his way to the monastery up winding mountain roads, Adam drives into a storm & swerves to avoid a figure that forces him off the road. Again, the feeling of almost overwhelming dread & fear is followed by the hand dragging him towards the precipice. There’s another episode at the monastery itself &, after talking to the Abbot, Adam realises that he will have to confront the spirit & find out what it wants with him if he is ever to be free from its influence. Confronting the spirit means that he must return to the White House. This is a wonderfully atmospheric story. Susan Hill’s ghost stories are always set in beautifully-realised landscapes. The abandoned house & garden are reminiscent of Manderley in Daphne Du Maurier’s Rebecca or the ruined castles in any number of classic ghost stories by Elizabeth Gaskell or May Sinclair. The monastery of St Mathieu des Etoiles is a perfect setting for contemplation as well as the supernatural encounter Adam has with the ghostly hand. The book is firmly situated in the present. Adam flies all over the world in his work, telephones & emails his clients & contacts, but the story is timeless. First person narration is the only effective way to tell a ghost story, I think. I felt myself growing breathless along with Adam as the feeling of dread grows stronger with every appearance of the small hand. Modern ghost stories can too often become horror stories with vampires, zombies & werewolves stalking their victims. I much prefer the subtleties of a delicate ghost story like The Small Hand. This is a gorgeous book to dip into. It was one of my last indulgences before I got back on the no book buying wagon after Christmas. 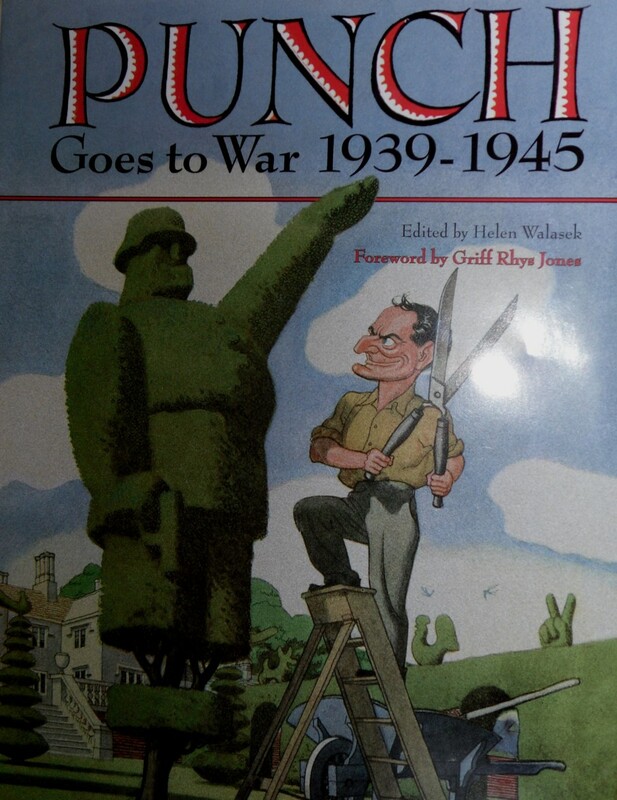 So, on this soggy Sunday in Melbourne, I thought I'd share some of the cartoons & pictures from Punch goes to War, a selection of the funniest cartoons & articles published in Punch during WWII. I like the Home Front ones best, that's my special interest. 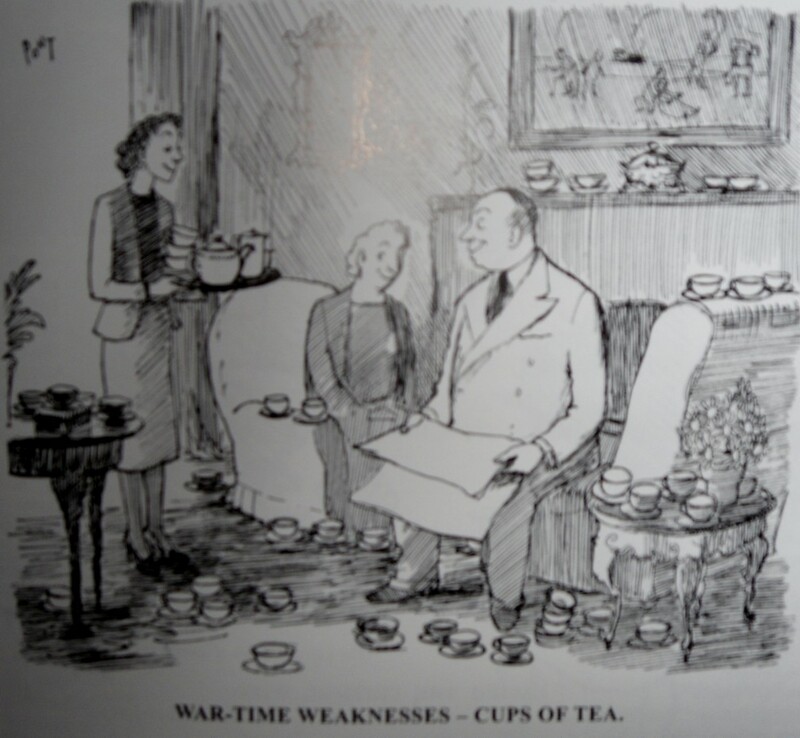 There's a whole series called Wartime Weaknesses. This one pokes fun at the English love of endless cups ot tea. It's by Pont (Graham Laidler). Fire watching was one of the most important jobs on the Home Front. 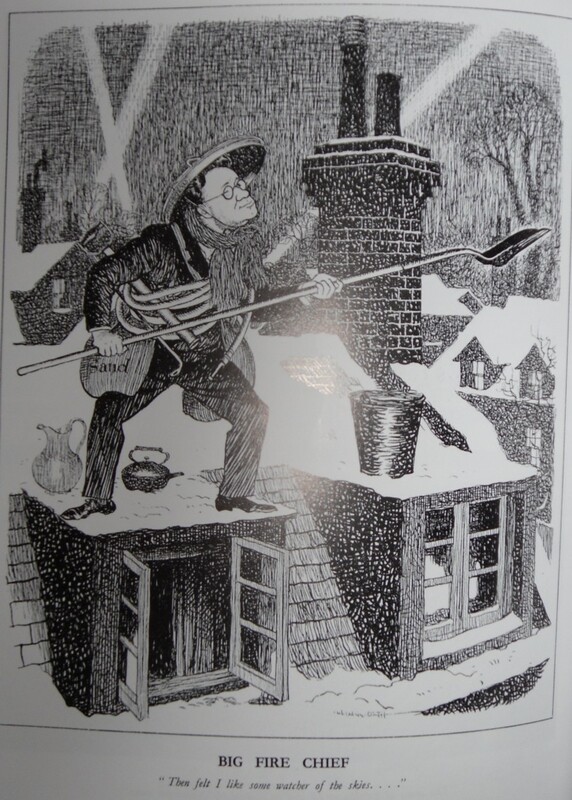 Here's the Home Secretary, Herbert Morrison, in full fire watching gear by Leslie Illingworth. This lady may have taken camouflage a little too far. By Rowland Emett. 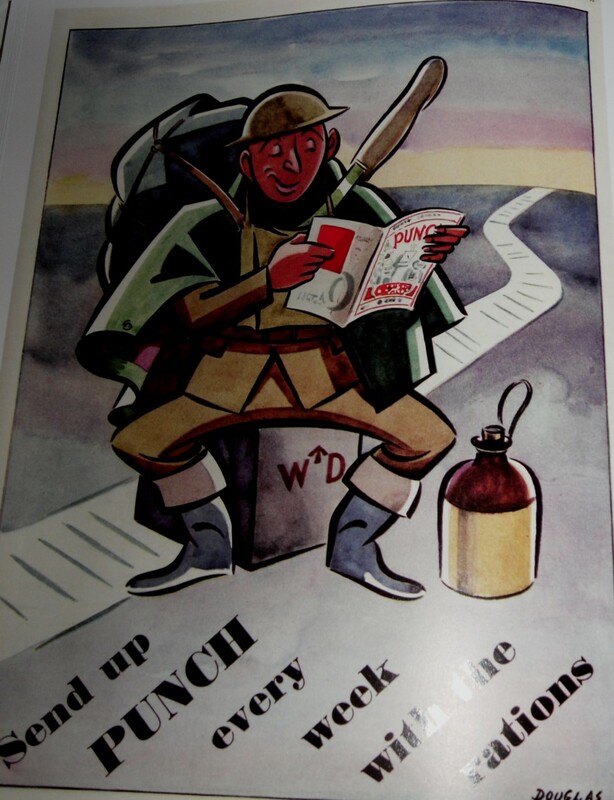 Punch was seen as essential reading for the troops as well as those at home. By Douglas England. 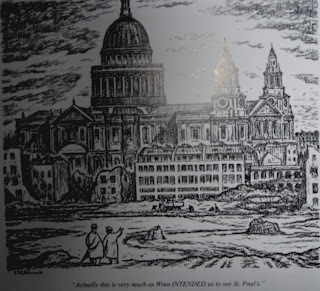 The Blitz spirit came to the fore after air raids like the one which devastated London on December 29, 1940. 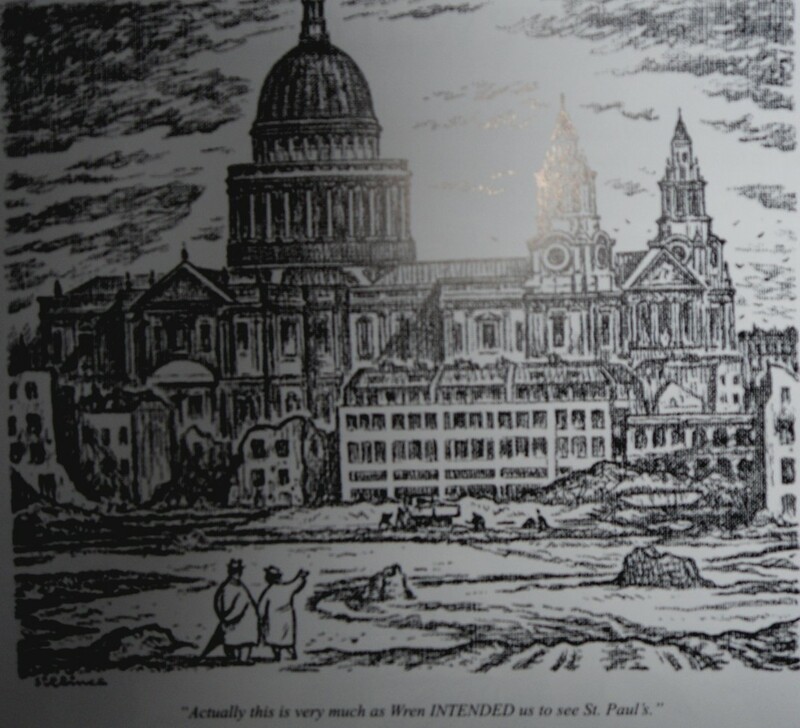 The survival of St Paul's Cathedral became a symbol of resistance.This cartoon is by W A Sillince & the caption is "Actually this is very much as Wren INTENDED us to see St Paul's." 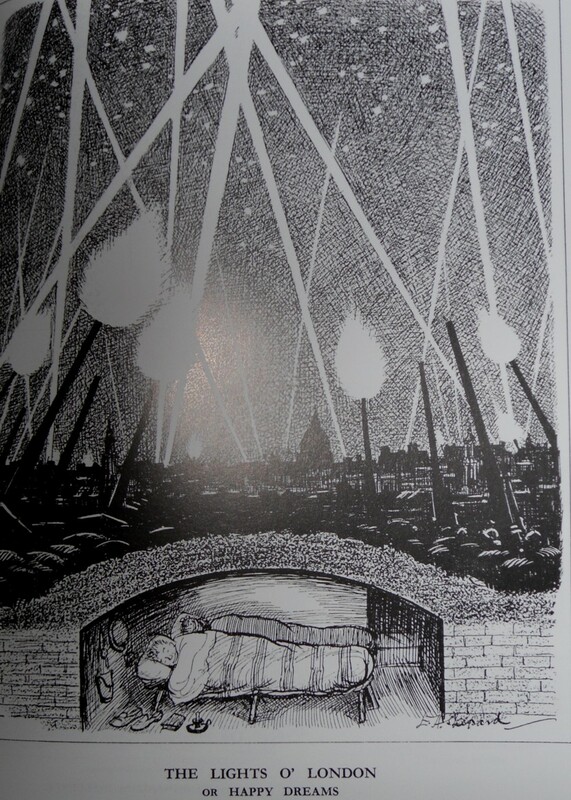 This picture by E H Shepard called The Lights O'London or Happy Dreams. I can only admire anyone able to sleep through that! 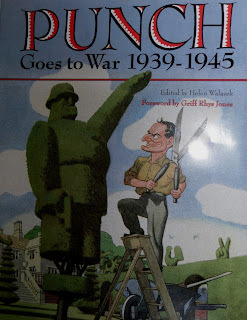 Punch goes to War is a lovely book that I'll be dipping into often. After a few weeks, Char goes back to work, living in the Hostel alongside her staff, because her mother refuses to have her comings & goings disturb her father. Char is a very unsympathetic character but I had to feel sorry for her when she arrives at the Hostel & has to unpack for herself, eat the cold, basic food that her staff live on & listen to the water gurgling in the pipes all night as her room is next to the bathroom. Even this experience doesn’t soften her attitude to anyone she believes isn’t giving everything to the work in hand. Grace hung up her coat and hat, and hastily made room on the already overcrowded peg for Miss Marsh’s belongings, as she heard Miss Delmege say gently “Excuse me,” and deliberately appropriate to her own use the peg selected by her neighbour. This threat was hardly carried out to the letter. No one could have failed to see a poignant consciousness of Miss Delmege’s existence in the elaborate blindness and deafness which assailed Miss Marsh when within her neighbourhood. A newcomer to the Depot, Grace Jones, soon realises that Miss Vivian’s martyred sighings hide a lot of inefficiency & unnecessary work. As she says, would Miss Vivian work so hard on a desert island where there was no one to see her? Grace is the daughter of a clergyman, kind, thoughtful, popular with her co-workers & soon becomes friends with Lady Vivian through her daily visits to Plessing during Sir Piers’s illness. It’s not the work you want to get back to, young lady; it’s the excitement, and the official position, and the right it gives you to interfere with people who knew how to run a hospital and everything connected with it some twenty years or so before you came into the world... you’re playing as heartless a trick as any I ever saw, making patriotism the excuse for bullying a lot of women who work themselves to death for you because you’re of a better class, and have more personality than themselves, and pretending to yourself that it’s the work you’re after, when it’s just because you want to get somewhere where you’ll be in the limelight all the time. They say the men don’t like talking about it; but I’ve had, I suppose, more experience than any woman in London, what with one thing and another, and they always talk to me. The dear fellows in the hospital I visit simply yarn by the hour – they love it – and it’s too enthralling for words. They’re so sweetly quaint. One dear fellow always talked about a place he called Wipers, and it ws simply ages before I realized that he meant Ypres! Wasn’t that too priceless? Is Mrs Willoughby an early version of the insufferable Lady Boxe of Provincial Lady fame? I loved The War Workers, it was compulsive reading. 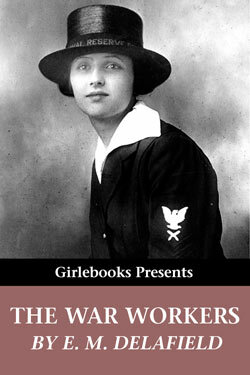 I was able to read this wonderful book on my e-reader thanks to Girlebooks, my favourite source for free e-books. I’ve been a fan of Bill Slider since the very first book in the series, Orchestrated Death. The plots are convoluted, the supporting characters are endearing & Bill himself is a terrific detective hero. In the first book, all those years ago, Bill was in a comfortable but boring marriage with two children. His job was his life. On that first case, he meets Joanna, musician & friend of the victim. Bill & Joanna fell in love & their relationship has been one of the strengths of the series. Now, in Body Line, they’re still together & the parents of young George. Bill’s father has moved in with them & he’s a great addition to the cast. Bill’s offsider, Jim Atherton, is Bill’s opposite in nearly every way. Sartorially splendid, fastidious &, until recently, a man with a talent for attracting women but unable to commit. Now, though, he’s in a happy relationship with journalist Emily. My favourite character though is Slider’s boss, Porson, who makes Mrs Malaprop sound ordinary. His speech is littered with phrases like “It’s hard evidence butters the parsnips”, “Hoist with his own canard” & “Isn’t there any light at the end of the funnel?” The whole book is littered with puns (including chapters titled Witless for the Prosecution & Who Dares Whinge) & it moves at a cracking pace. I finished it in two sittings, I just couldn’t put it down. I wish I could read these books more slowly as I’ve got at least a year to wait for the next one. 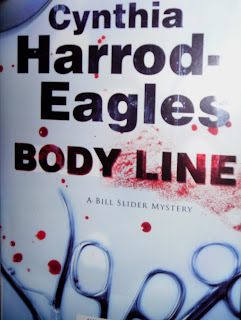 The plot of Body Line is suitably devious & littered with red herrings. David Rogers is found shot dead early one morning in the hallway of his luxurious house. His girlfriend heard the shot, caught a glimpse of the back of the gunman’s head & escaped by dropping over the balcony. Rogers was a doctor who had at least two girlfriends who really knew very little about him. He was rich, handsome & charming. He lived the lifestyle of a consultant but no one in his life seemed to know exactly where he worked or what field he was in. He had no family & an ex-wife who seemed glad to have seen the last of him. As Slider discovers more girlfriends who all thought they were the only one & realises that ex-wife Amanda Sturgess & her partner may have had a financial reason for wishing David dead, the motives for murder start to pile up. The murder looked like a contract killing but who would be able to arrange that? The questions about where the victim’s money came from when he didn’t seem to have a job & what he did on his weekly trips to Southwold lead Slider & his team into a murky world of smuggling & another side of David Rogers’s secret life. 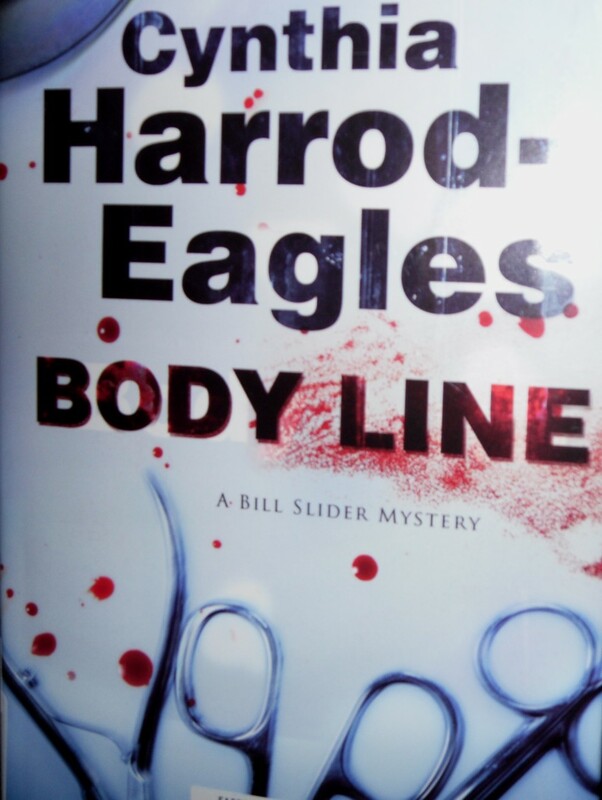 The Bill Slider books are perfect for anyone who enjoys British police procedurals with humour & great plots. Meeting up with Bill, Joanna, Atherton, Porson & the rest of the firm at Shepherd’s Bush police station is a real treat. Jeanne d'Albret: Heather Darsie's Anna of Cleves blog tour. "A Vast Symphony in Stone"
A Chance to Get Your Debut Novel onto the Bookshelves? Anne Brontë Bicentenary (2020) - early notice! Friends, it’s been a long time!